On a cold Tuesday morning in September, I found myself navigating Newcastle Central Station, which was surprisingly busy for a weekday morning. I located my seat in the middle carriage and sat opposite a middle-aged woman whom made polite conversation with me regarding the weather and mildly busy train. The woman, who’s name I later learned was Jean, preached about her favourite fish and chip shop in central Carlisle. 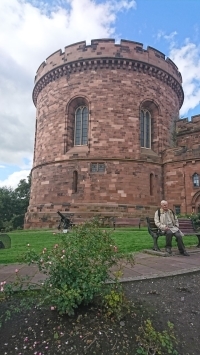 After a leisurely journey, and some mints, I arrived in Carlisle, and departed the train. I was elated to find that the weather had improved significantly. My first stop was the picturesque Citadel, which looked as if it had come straight from the front of a postcard. 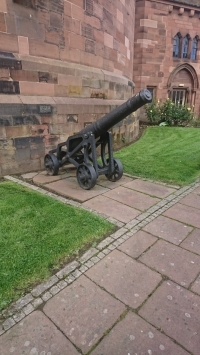 My favourite aspect of the impressive Citadel wasn’t the fact each and every stone was seeped in history, but rather superficially, my favourite feature was the canons. They really appealed to my inner child and looked like something from ‘Game of Thrones’. I walked through a rather pretty square in the city centre, and paused to feed some pigeons some of my sandwich, which I enjoyed before a proper lunch. The cathedral was my next stop. 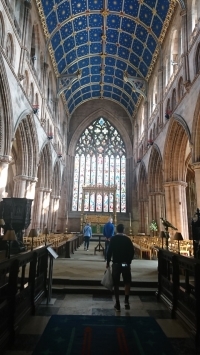 I was pleased to find that the cathedral was particularly popular with tourists; I picked up several foreign accents as I made my way through the crowd. The cathedral was accompanied by a set of well-maintained gardens and a gift shop. The castle, which I visited next, would probably have been my favourite attraction of the day had it not been for the main road running alongside it. The scenery was incredible and I wish I’d had more time to explore it. On the way back to the station, I stopped at the Little Chippy, the establishment Jean had suggested on route to Carlisle, for a sausage and chips instead of my sandwich. The second train of the day, to Haltwhistle, was a lot less busy than the first, but lacked the entertaining conversation I’d enjoyed with Jean on-route Carlisle. After a short train ride, I made my way to Old Booking Hall for a meeting with the board. ‘Meeting’ was a bit of an overstatement, and I felt initially at ease with the friendly and welcoming board members. The cakes were a lovely, and a pleasant touch to the meeting. Whilst mingling with the board members, a friendly gentlemen informed me that Haltwhistle was the exact centre of Britain, marked by a plaque, a fact I found particularly interesting. Having had a pleasant, but busy day, the year ahead working for TVCRP is set to be very enjoyable.